Sri Vilvaaranyeswarar Temple at Thirukkollamputhur (Thirukkalampur). Visited on: 1st April, 2018. 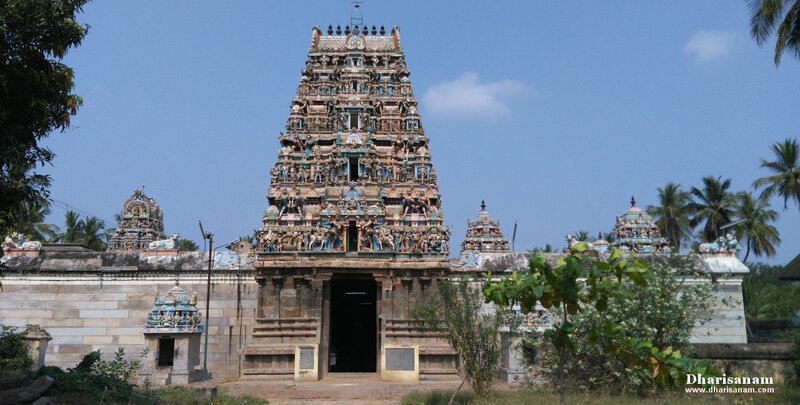 Thiru Kollampudur (Thiru Kalampur) is situated at a distance of about 20 kms from Kumbakonam on the Kumbakonam to Thiruvarur route (Via Kudavasal, Sellur and Koradacheri). From Koradacheri, this place is about 6 kms and from Kudavasal, it is about 7 kms. 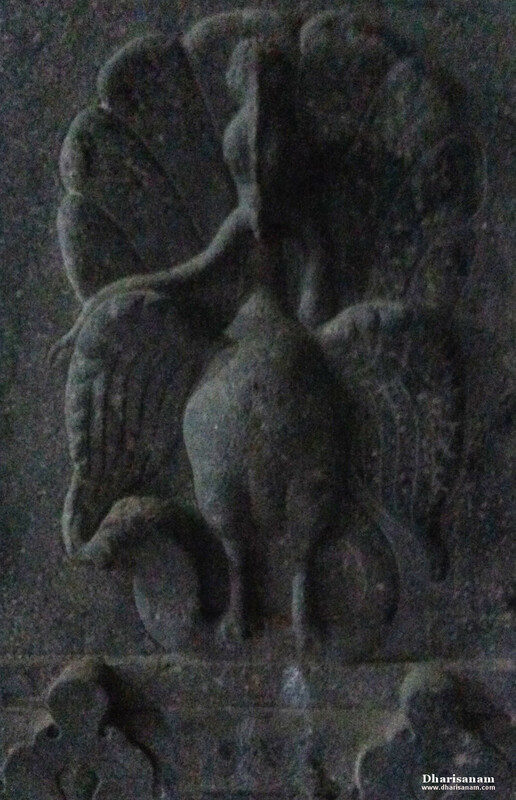 Other Devara Paadal Petra Shiva Sthalams near this place are – Thirucherai, Kudavasal, Thalaiyalangaadu, Peruvelur, Karaveeram, Naalur Mayanam, Kaduvaikarai Puthur (Andankoil), Penu Perunthurai, Thiru Naraiyur Siththecharam, Arisirkarai Puthur, Sivapuram, Karukkudi and Kalayanallur. 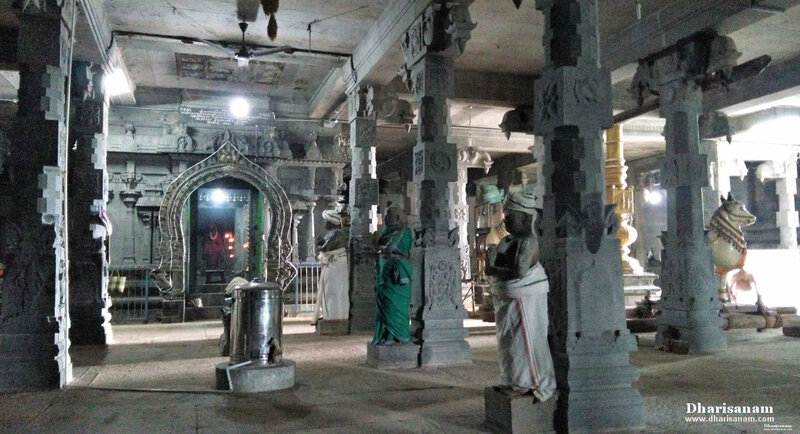 This is one of the 276 Devara Paadal Petra Shiva Sthalams and 113th Shiva Sthalam on the Southern bank of the river Cauvery in Chozha Nadu (Thenkarai). This temple is one of the “Pancha Aaranya Sthalam”. Saint Thirugnanasambanthar sang a pathigam here in order to keep his raft afloat on a flooded river. He crossed the river without the help of a boatman to reach this temple. 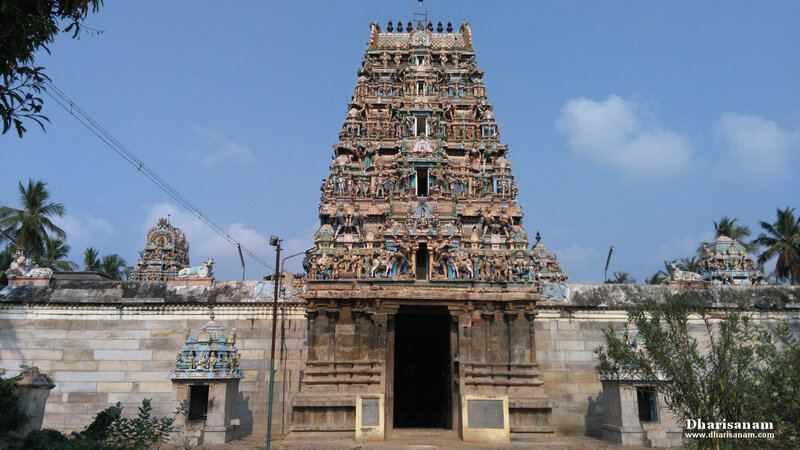 This east facing temple has two corridors and its main tower (Rajagopuram) has 5-tiers. In front of the main tower, there is an arch in the outside corridor with beautiful sculptures of Lord Shiva and Goddess Parvathy, Vinayakar and Murugan. The last consecration ceremony (Maha Kumbabishekam) took place on 01.07.1979. According to legend, in ancient times, this region was a forest densely covered with Vilva trees. Vilvam trees are also called “Koovilam” and hence this place gets the name Koovilambuthur. Later it has been changed to Kollambuthur. These Vilva trees are said to have grown on the place where the celestial nectar “Amirtham” fell on earth. This sthalam is considered as auspicious as Kasi. 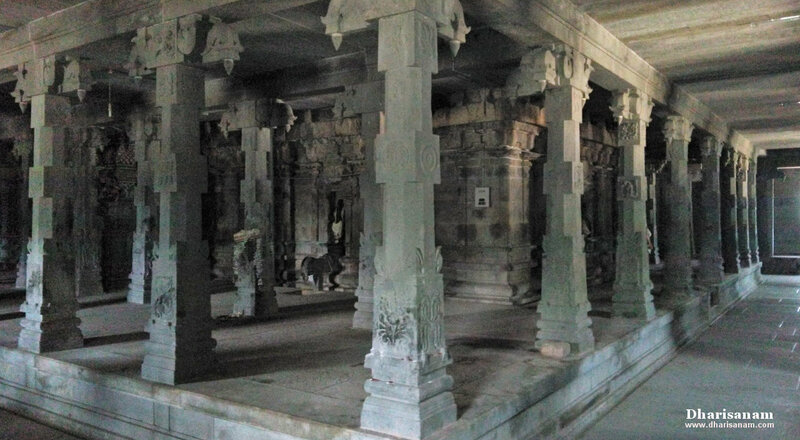 This ancient temple is situated on the bank of the river Vettaru (Mulliyaru), a tributary of the river Cauvery. This river is also known as Agathiya Cauvery. The historical names of this place are Panchatchara Puram, Kandeepavanam, Brahmavanam, Koovilambuthur and Thiru Kalampur. 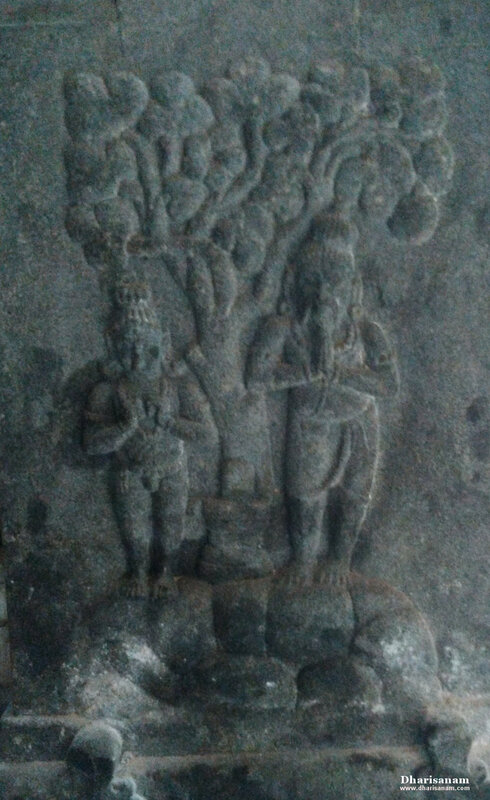 As per stone inscriptions, this temple was built by Chola Kings Kulothungan-III and Rajarajan-III. 5. Sri Vilvavaneswarar Temple at Thirukkollamputhur with “Vilva” forest. Sage Agasthiyar is believed to have said that worshiping the lord in these five temples in a single day is very auspicious. By doing so, all our sins will be absolved and we will break free from the repetitive cycle of birth and re-birth. These temples should be visited in the same order given above at the following times - early morning, morning, noon, evening and night. It is believed that Saint Thirugnanasambanthar worshiped Lord Shiva at these temples in this order. According to legend, when Saint Thirugnanasambanthar visited this place with his followers, the river Vettaru (Mulliyaru) was flooded and nobody dared to operate the boats. He came to this place after visiting the rest of the four Aaranya sthalams and he wanted to complete his worship in this temple. He sang a Pathigam “Kottame kamazhum koḷḷam puthur nattam ... ..…” and crossed the river on a raft along with his followers. The beauty of this pathigam is that it helped his stay afloat without the help any boatman even during the torrid conditions. It is believed that Lord Shiva and Goddess Parvathy gave darshan to him on the river bank itself. It is believed that this incident took plave on the day of Deepavali. Everybody was waiting for Sambanthar’s arrival but he was getting delayed due to the floods. As the time for the last pooja was nearing, the priests were in a dilemma about what they should do. At this point, it is believed that the lord’s divine voice was heard saying that Sambanthar would arrive shortly and that they should wait for his arrival before conducting the day’s last pooja (Ardhajama pooja). This event is celebrated even now on the Deepavali day (new moon day in the Tamil month of Aippasi) when the idol of Sambanthar is taken in a procession to the other side of the river and then brought back to the temple. 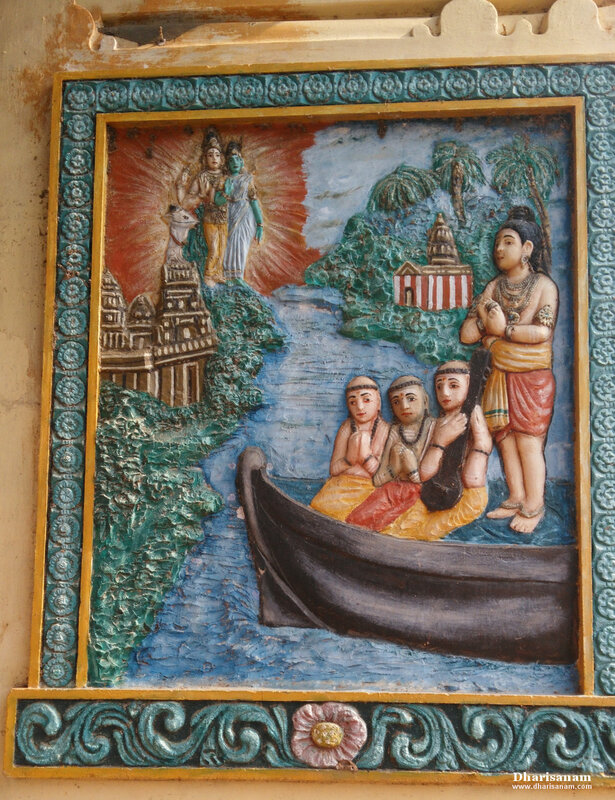 On his arrival at the river bank, the idols of Lord Vilwavaranyeswarar and Goddess Soundara Nayaki give dharisanam to Sambanthar. There is a small shrine for Saint Thirugnanasambanthar on the other side of the river bank of Vettaru. 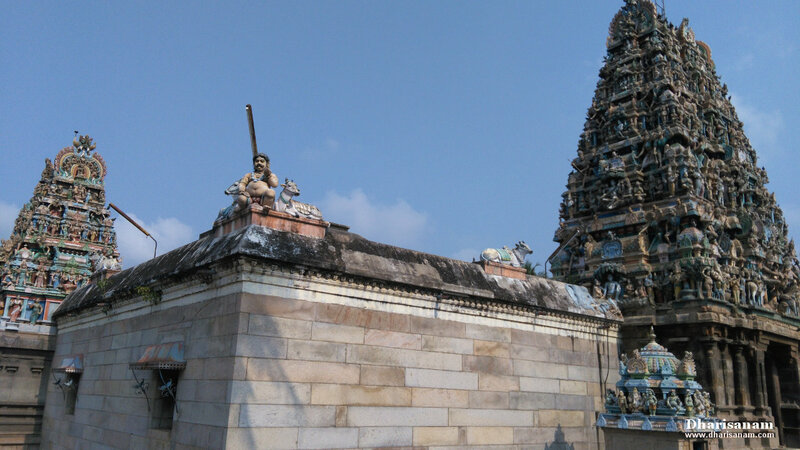 This shrine is known as “Nambar Koil” – nambar refers to the saint. This river is also known as “Odam Pokkiya Aaru”. As per Sthala Puranam, Lord Shiva himself tells the “Panchatchara Mantra” – Na Ma Si Va Ya – to the people who die in this place. The lord tells this mantra in the right ear of the deceased and bless them with salvation. Hence this place also gets the name “Panchatchara Puram”. Lord Shiva is believed to have given darshan of his cosmic dance to Sage Dhurvasar here. 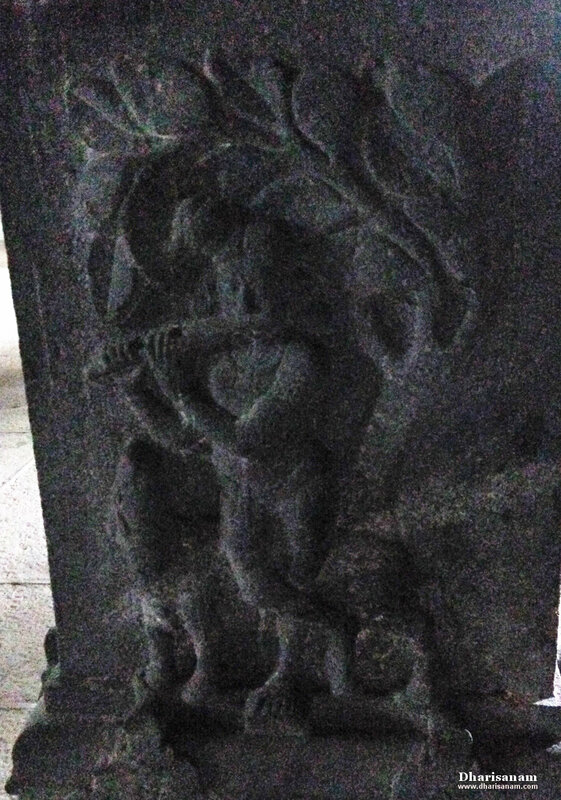 Also, Lord Shiva is believed to have given his wedding darshan to Sage Agasthiyar. 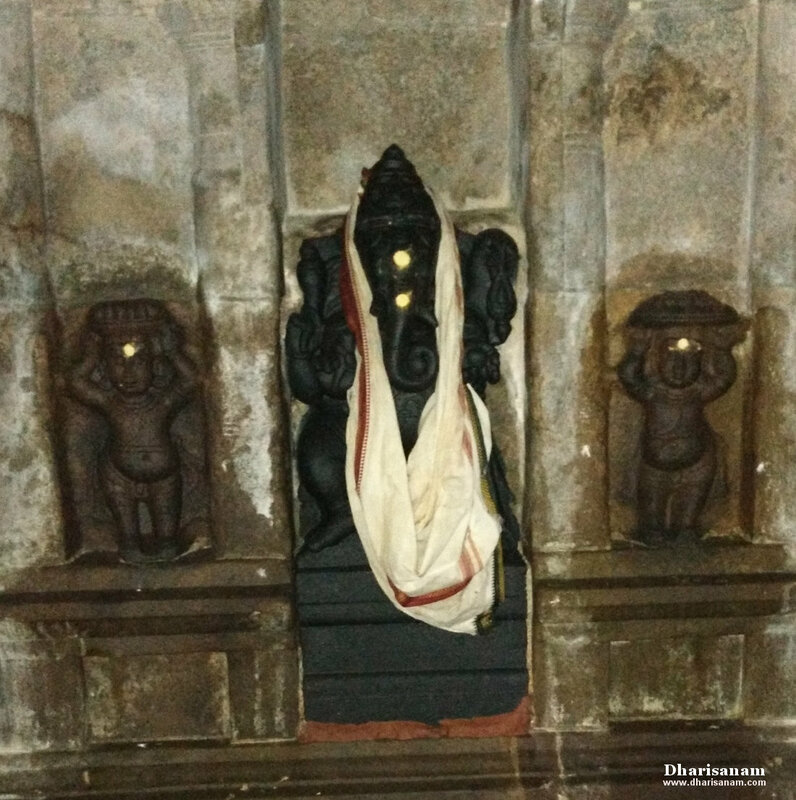 It is believed that Lord Vinayakar, Lord Brahma, Arjunan, Ganga, Kaveri, serpent Adhiseshan, sages Biruku, Kasyabar, Vashistar, Vamadevar, Kanva, Idaikkadar, King Kochenget Cholan and King Varaguna Pandiyan have worshiped the lord here. Poyyatha Vinayakar, Dandapani, Vinayakar, Murugan with his consorts, Katchi Koduthavar, Lakshmi Narayanar, Gajalakshmi, Saraswathi, Visalakshi, Gangai Amman, Navagraham, Iyanar, Mariyamman, Bairavar, Suryan, Chandran, Saneeswarar, Nalvar, Valampuri Vinayakar and Mahishasuramarthini can be seen in the main hall and the corridors. There is also an idol of a Chola king along with his wife. 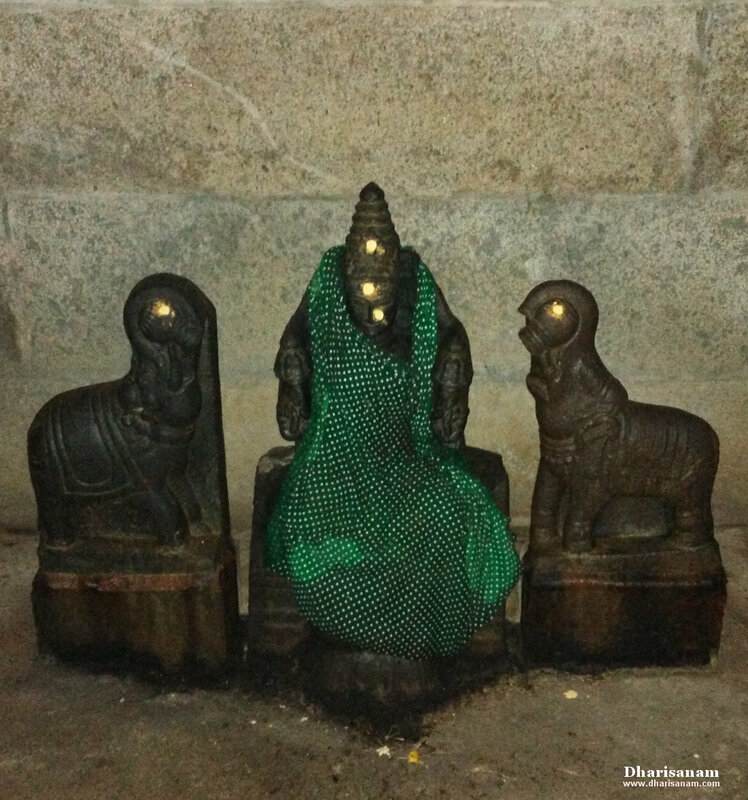 There are three Shivalingams here named Gajamuktheeswarar, Mahaalingam and Aadhi Vilvanathar. 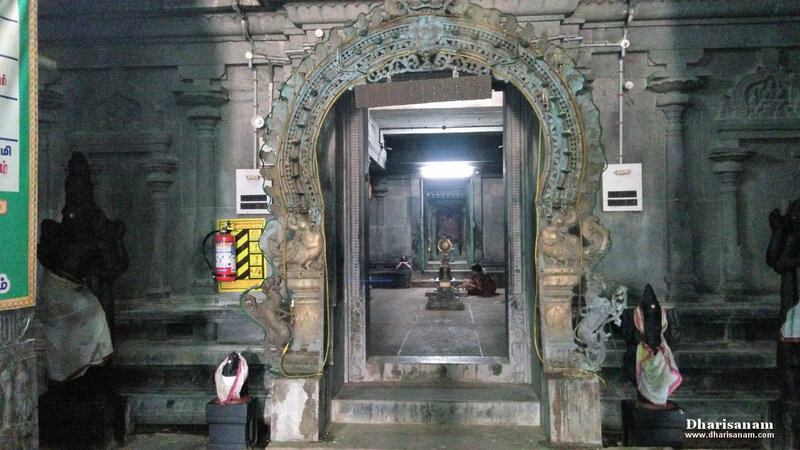 Pancha aranya shivalingams - Mullaivana Nathar, Satchinathar, Pathala Varadhar, Vilvanathar and Aapathsahayeswarar can also be seen in the corridor. 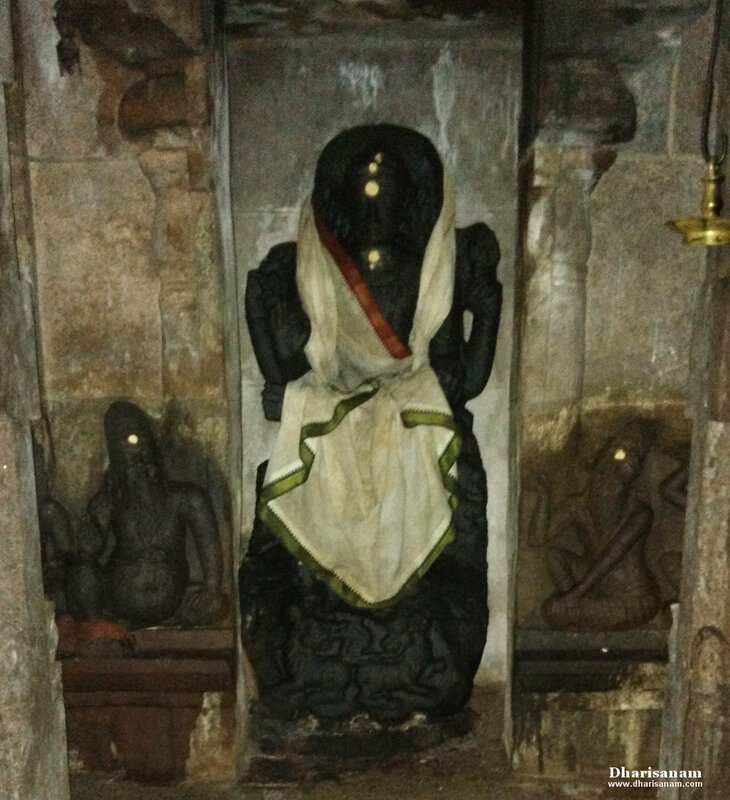 In the “koshtam” (place surrounding the sanctum sanctorum), idols of Narthana Vinayakar, Dakshinamurthy, Lingothbavar, Brahma and Durgai can be seen. Separate shrines for Vinayakar and Dandapani can be seen on either side of the main tower. 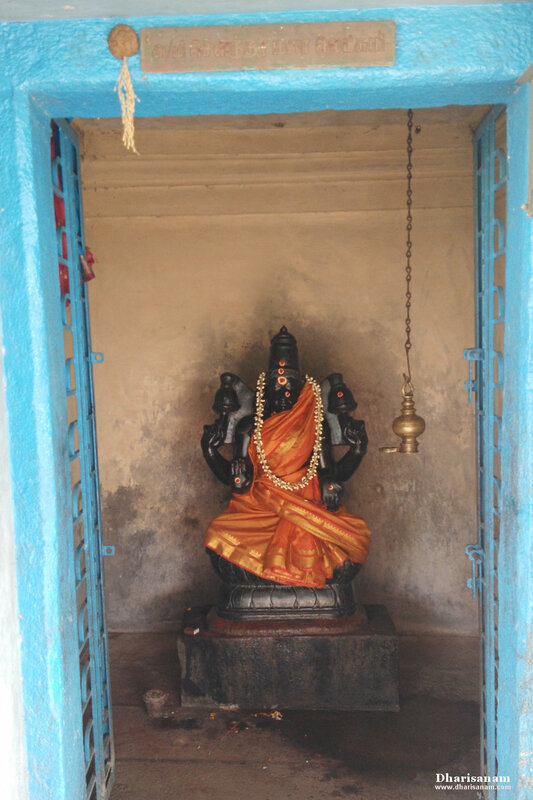 There is a separate shrine for Goddess Soundara Mahalakshmi in the outer corridor. This temple is considered to be significant for its three important attributes – Moorthy, Sthalam and Theertham - glory of Lord, sacredness of the land and the auspicious temple tank. 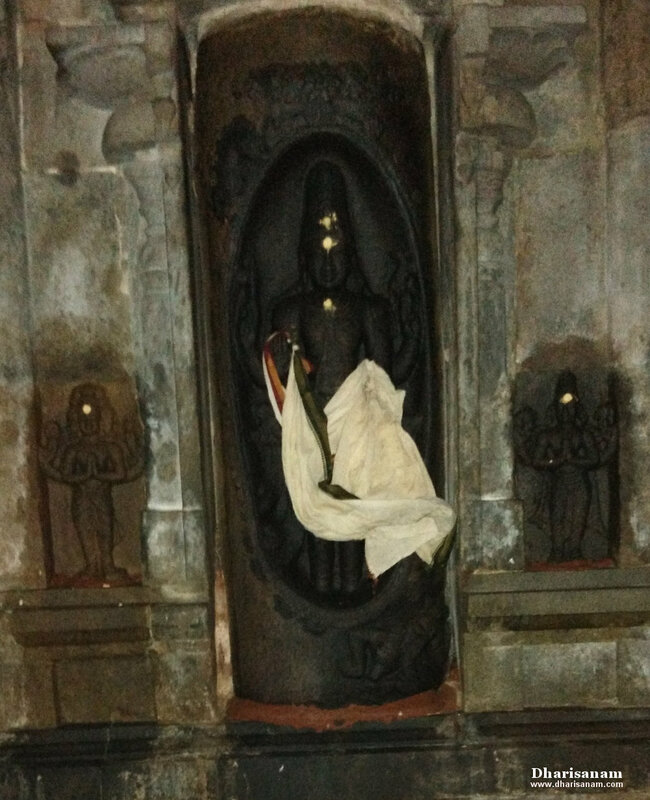 Behind the sanctum sanctorum, on either sides of Lord Lingothbavar, there are idols of Lord Mahavishnu and Lord Brahma in a worshipping posture. Devotees can enjoy the darshan of all the three lords (Trimurthys) – Brahma, Vishnu and Shiva. This is considered to be very auspicious. The idols of Mahishasuramarthini, Gajalakshmi and Soundhara Mahalakshmi are very beautiful. The front hall, built entirely using granite, has many beautiful pillars that are engraved with many intricate sculptures. 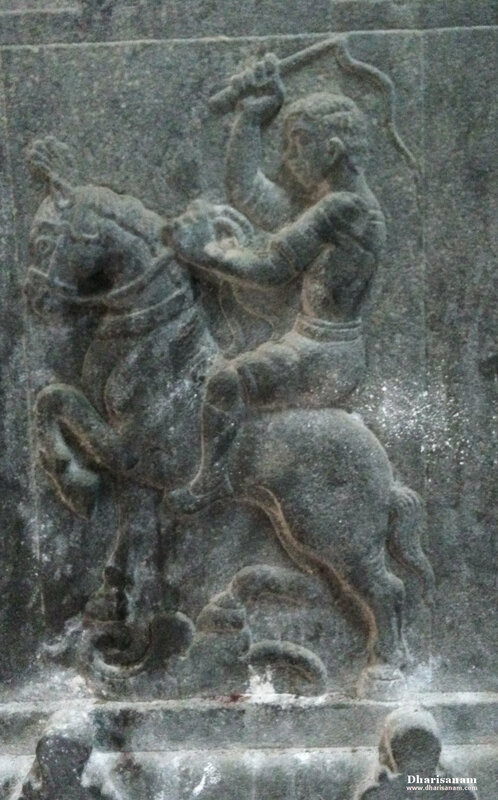 There is a beautiful relief in a pillar depicting Saint Thirugnanasambanthar and his followers crossing the river on a raft. 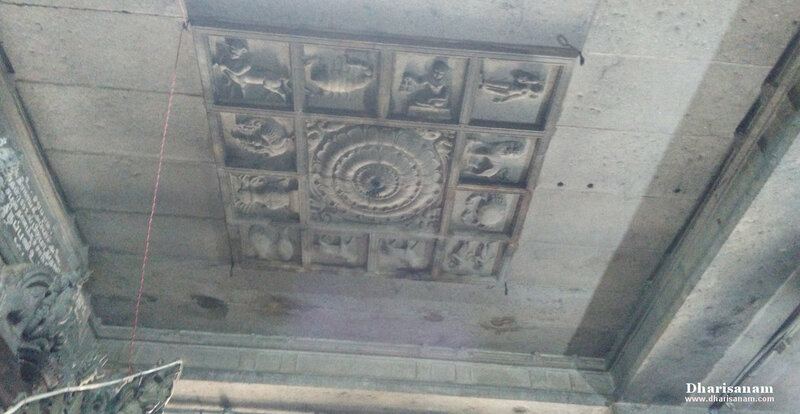 In front of the hall of Goddess Parvathy’s shrine, on the ceiling, 12 zodiac signs (Raasi) are carved beautifully in stone. It is believed that by standing under one’s respective zodiac sign and praying to the goddess, one’s wishes will be fulfilled. 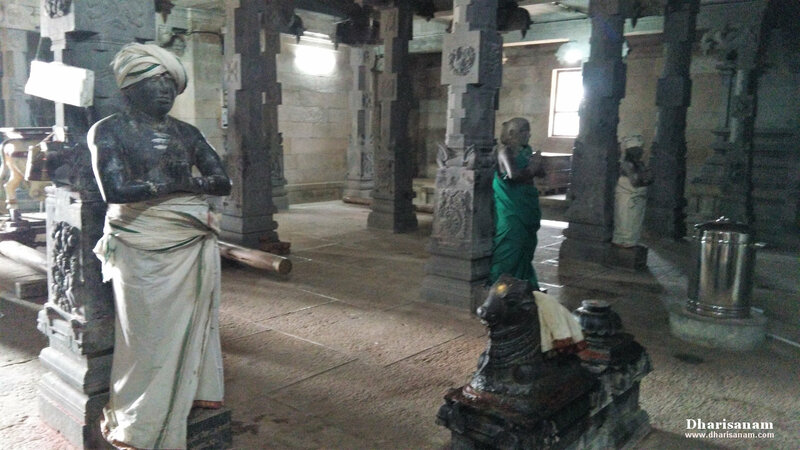 The statues of the Nagarathar (Chettiars) who built this temple using granite can be seen in front of the Goddess’s shrine. Participating in this temple’s boat festival is considered very auspicious. Devotees believe by participating in this festival they would be blessed with prosperity and happiness. Those suffering from mental ailments can worship the lord here to get relief. Devotees also believe that by worshiping the five “Aaranya” temples in a single day, they will be freed from the harmful effects of any planetary position in their horoscope. Boat festival (“Odaththiruvizha”) on the day after the new moon in the Tamil month of Aipasi (Oct- Nov) is celebrated in a grand manner. Brahmotsavam is celebrated here on the full moon day in the Tamil month of Chithirai (April-May). Panguni Uthiram in the Tamil month of Panguni (Mar-Apr). 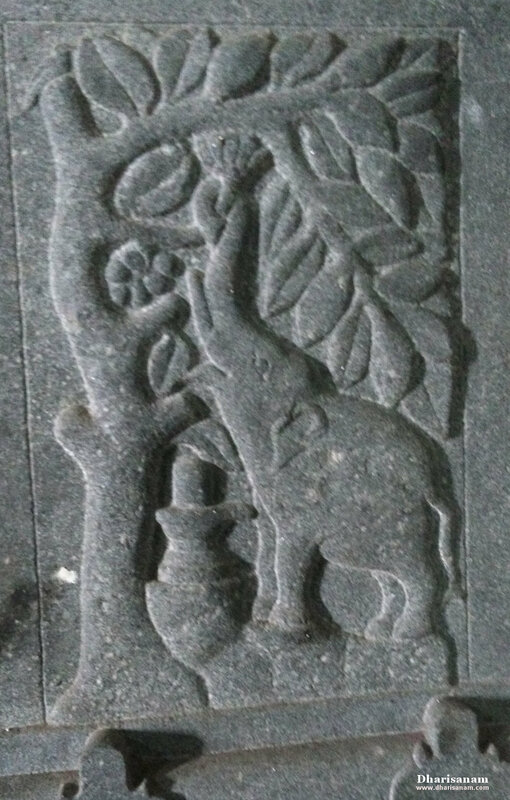 Tamil Nadu – 613 705. 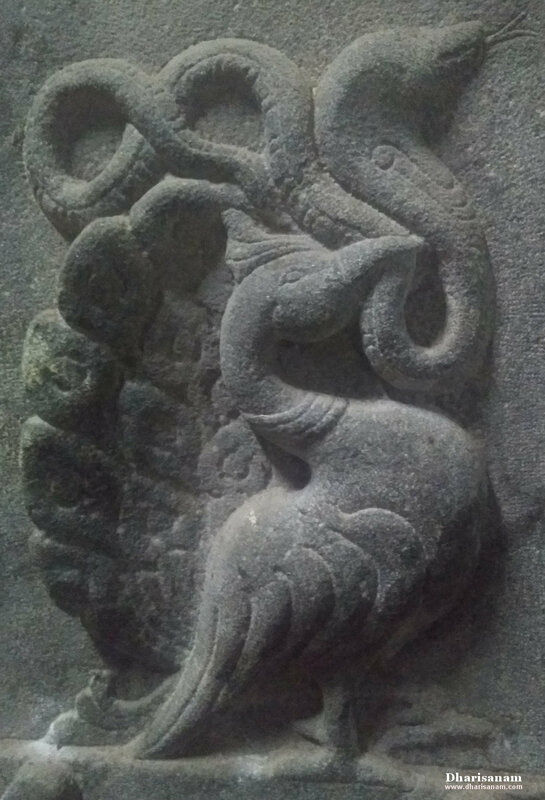 Sri Panchabakesa Gurukkal at +91 – 94448 08017. ஓடமானது ஆற்றைக் கடந்து செல்லத் தனக்குத்தானே தள்ளப்படுவதாக. ஆற்றைக் கடந்து செல்லத் தனக்குத் தானே தள்ளப்படுவதாக. நம்பனே! ஓடமானது ஆற்றைக் கடக்கத் தனக்குத் தானே தள்ளப்படுவதாக. நம்பனே! இறைவனைத் தியானிக்க ஓடம் தானாகவே தள்ளப்படுவதாக. நம்பனே! சிவபெருமானைத் தியானிக்க இந்த ஓடம் தானாகவே தள்ளப்படுவதாக. உன்னைத் திருக்கோயிலில் கண்டு வழிபட அருள்புரிவாயாக. வல்லவர்கள் எப்பொழுதும் தேவர்களோடு கூடி மகிழ்வர்.